21 Day Fix - 15 lbs Lost! Can you really lose up to 15 pounds in 21 day? YES you can. The 21 Day Fix is Beachbody’s newest, and can I say most popular program out right now. And its perfect for anyone of any level of experience! Even if you’re in great shape its a great mix to what you already do! One of the main reasons the I became a Beachbody Coach is because of the loyalty Beachbody has to committing to creating programs that are made for lifestyle changes, NOT diets! Diets are temporary actions that bring temporary results. So is the 21 Day Fix healthy and will the weight stay off /will I maintain my results? Again this is an easy answer. YES! Well maybe! Why/how you might ask? I want to be honest with you here. Remember what I just said about diets? How they are temporary. Well you will maintain the results and you can continue to lose weight if you continue on with additional rounds of the 21 Day Fix and use the knowledge you’ve acquired from this program in your daily life. Like all things, if you do it to get the results, then stop and go back to your old ways, then you can’t expect to keep what you had. That again is called a diet, and thats why diets don’t work. 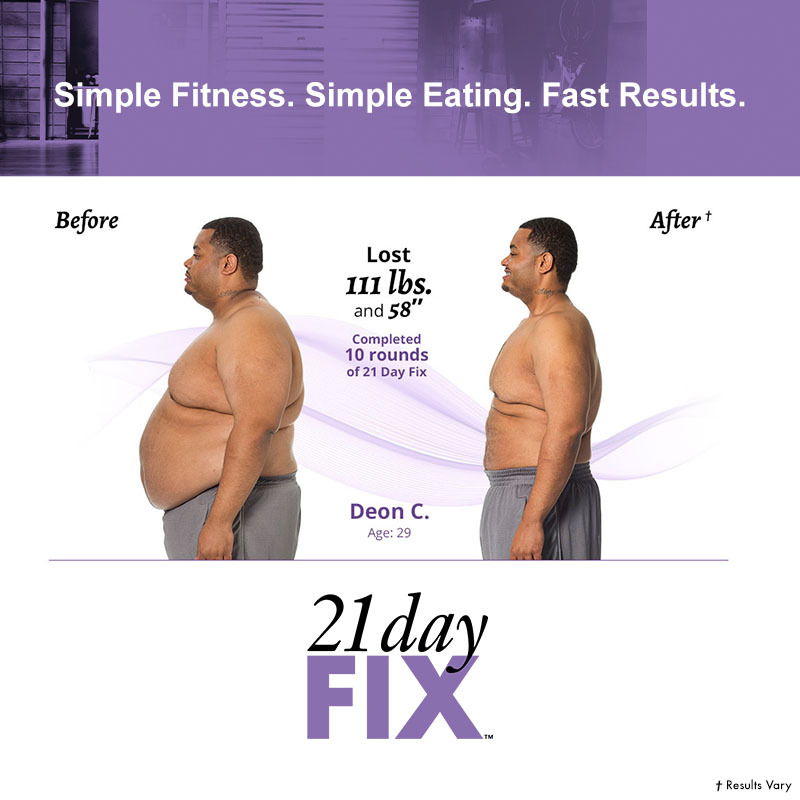 Deon C. in the picture below did the 21 Day Fix for his first round and loved the results he achieved. He didn’t want to stop there. So he continued on and did another 9 rounds for a total of 10 rounds. Lost 58 pounds!!! So how is he doing now? Great! Why? Because he not only has 30 minute workouts that fit conveniently into his schedule, but he has knowledge of how to portion out his food, and what food groups get what portions. I eat salad everyday…I haven’t lost weight. How will this help me? Lots of people eat salad everyday and are overweight. Lots of people TRULY (I put the emphasis on truly for a reason) eat 3-5 healthy meals each day as you should and are still overweight or not at the desired size or physique. Why? Its all because they are eating to much. Remember the old saying, “to much of a good thing can be bad”? Thats very true. In fact this is the reason that Autumn Calabrese created this program. She said that she’d been working with a client for sometime, and the client wasn’t reaching the results they wanted. She knew the client was eating healthy and balanced meals. They went to lunch one day. They both ordered the same salad. Autumn said that it was a big salad and that she only ate about 1/3 of it. Her client ate the entire salad. That told her a lot about what the problem was. So she created the portion control system and BAM!! Success followed. She has multi-colored containers for you to use. Each color represents a food group. So there really is no guess work. 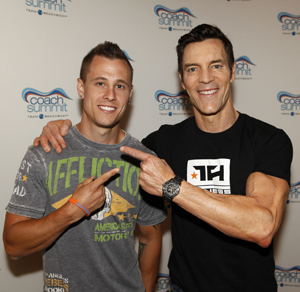 This is probably one of the most simple and effective programs to date that Beachbody has released. Good question! I usually have a full review of the programs to tell you what I like and don’t like. I know I’ve promised a full review on this program. But the 21 DayFix has been SO POPULAR that literally it has sold out and for a short time was only available by pre-order. I think its still like that now, EXCEPT if you get the Challenge Pack which is now the only thing I recommend, because a challenge pack has everything you need to succeed. 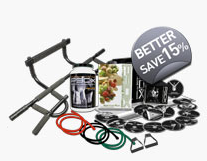 It has the workouts, nutrition guides any included equipement and the #1 most important meal of the day…Shakeology. If your going to take control of your life you need to take it seriously. YOUARE THE MOST IMPORTANT THING IN YOUR LIFE! Start acting like it! Now back to the question. Since Im a coach, I can’t order a challenge pack. I already drink Shakeology so I had to pre-order just the product. Don’t fear though. If aren’t a coach and you want to become one, and share your new lifestyle with others and make some cash doing it, you can get the 21 Day Fix Challenge Pack and actually the normal $39 coach signup fee is waived! 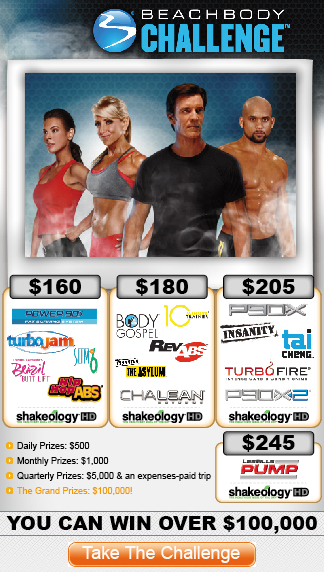 Plus as a coach you get discounts on your shakeology and other purchases that you make with Beachbody. Are you ready to become a coach? I want to talk to you about it! Contact me ASAP so we can get you started! If your a “go-getter” and ready for something new and fun and AWESOME, then I want you on my team! If you just want free support and don’t want the coach discounts or want to make any extra money and just want to take care of yourself then thats ok to. Get the 21 Day Fix Challenge Pack and you’ve got me as your coach, tons of free support, and an awesome community of people who are working towards the same goals as you! “If you’re still not convinced. Take it from me. This program works. I preach being the “proof the product works”, so I put it to the test. I got a preview version of the 21 Day Fix program, and got to work. 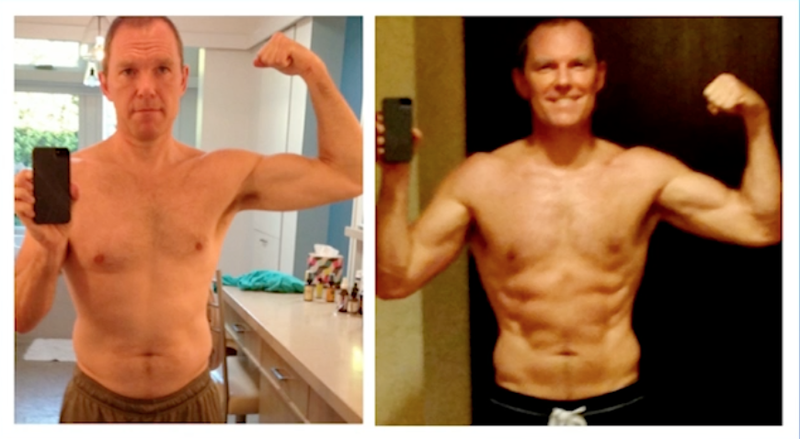 My results – 11lbs off, and 3″ off my waist, in 21 days. It would be great to have healthy testosterone levels that enrich your everyday life. There is an easy fix to this. Use lean nutraceuticals natural testosterone booster to uplift your testosterone levels.